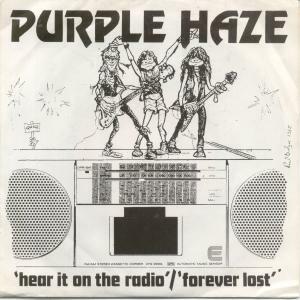 Purple Haze were a melodic hard rock band from New Ross. The original trio formed in 1980 was John Fleming (guitar), Jim Ryan (bass) and Ray Mullins (drums). There were several lineup changes over the bands 5+ year lifespan. Paul Bolger (vocals) and Paul Purcell (vocals) both came and went before Martin Quigley AKA Quig joined as lead singer. When he didn't work out, Stephen Roche who'd replaced Jim Ryan on bass took over lead vocals. 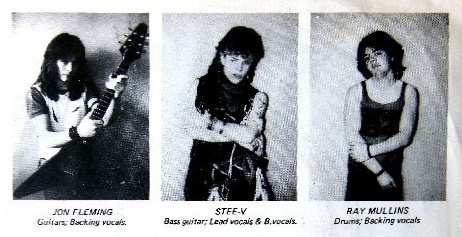 This was the lineup that recorded the bands sole single in 1985. Martin Quigley remained with the band as sound engineer and manager. 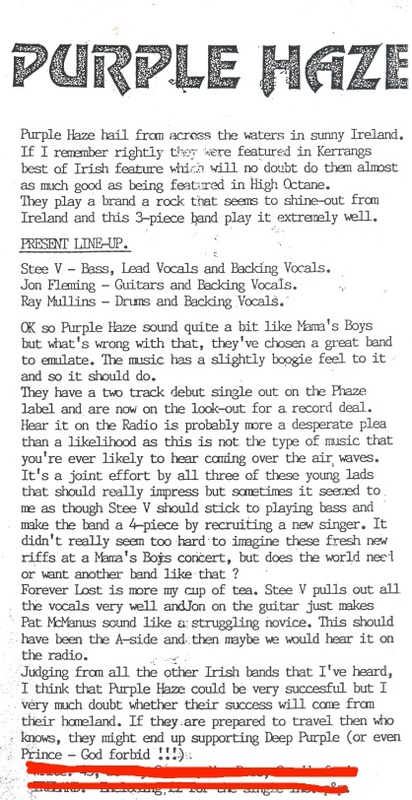 Purple Haze gigged extensively in the south east of Ireland and played as special guests on the Mamas Boys xmas tour in 1982. They also played with Auto Da Fe and Cry Before Dawn. The band made several demo tapes and finally in February 1985 recorded their debut single at Slane Studios. Both tracks are credited to Fleming/Roche/Mullins and produced by John Dee & Purple Haze. The A-side "Hear It On The Radio" is a little too pop metal for my tastes and is let down by the vocals IMO but the B-side "Forever Lost" is much better. While it was well received in the music press (including a Jon Bon Jovi review in Kerrang! -- see below) and received some airplay, the single wasn't the break through the band had hoped for and they split later the same year, citing personal and financial reasons. 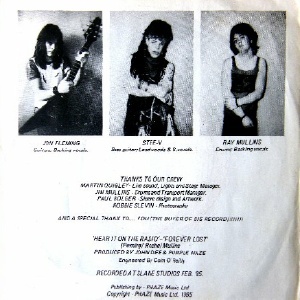 In late 1985 Jon Fleming (guitar) and Ray Mullins (drums) formed a short term recording project called Dirty Fingers with Paul Purcell (vocals) and Robbie Dunphy (bass). Though they recorded a demo tape at Slane Studios, it was always intended as a short term project and Ray Mullins and John Fleming emigrated to the USA where they formed a band called Roisin Dubh with Shandeen Martgan (vocals and keyboards) and Stanley Joseph (bass). Mullins, Dunphy and Bolger are still active on the local Waterford music scene. In 2011 Purple Haze reformed for some gigs, the band now a quintet with the original trio plus Stephen O'Hanlon (vocals) and Mick Fleming (guitar). Thanks to Martin Quigley for his help with this page.